Since its establishment in 1984, DR Valve Co., Ltd. has developed valves for power plants, valves for ultralow temperature, and valves for high temperature and high pressure through ceaseless R&D and standardized qualitycontrol systems, exporting to over 10 countries around the world, as well as selling in the domestic market. DR Valve supplies the best products to various industrial sites, such as refining and petroleum, chemicals, power plants, gas and LNG industry, desalination plants, ocean industry, environmental plants, etc. Butterfly valve has a simple structure, is easy to operate and widely used for flow path blocking and flow/pressure control. However, the disk surface of the valve is wider than that of other valves, and deflection of the disk is generated due to the working pressure. At this time, the disk is press-fitted into the seat ring like a wedge and, as a result, the operating torque is very high, causing a large impact sound and vibration when the valve is opened and closed. In severe cases, the rotation axis of the valve may be distorted. In order to solve these problems, this product has a triple offset structure in which the shape of the disk is asymmetrical, so that when the valve is closed, the disk and seat ring is of the structure in line contact at the endpoint. Therefore, the airtight performance is excellent and there is hardly abrasion of the seat ring, which is a chronic problem of conventional products. The triple offset structure has drastically reduced noise and vibration resulting from high operating torque, which had been a problem in the conventional products, by dispersing the surface pressure acting on the disk surface in the system requiring high pressure (differential pressure) to the disk. The characteristics of the product are the flow control capability, which is an advantage of globe valves, and a simple structure that is a merit of ball valves. This product has solved the shortcomings of globe valves, which are expensive, relatively low flow rate, the cavitation phenomenon caused by the bent pipe and generation of noise and vibration, and the disadvantages of ball valves including sludge inflow between ball and body and seat ring breakage in the fluids containing fiber (paper pulp)-like sludge at the time of valve locking. The Easy V-Notch Ball Valve has a seat ring installed on one side only, and the ball has a “V”-shaped notch to control the fluid to the EQ%. The shape of the “V” notch is designed to fit for the characteristics of fluids so that the control capacity can be changed according to such characteristics. In addition, due to the offset structure, the seat ring and the ball are in line contact at the closed end. Thus, the airtight performance is excellent and there is almost no abrasion of seat ring. As it is like a sharp cutter, “V” notch displays very favorable performance for use in fibrous piping lines like paper (pulp) line. [INQ. NO. 1607M13] DoTEC is a professional valve manufacturer with many years of proven track record. DoTEC has been dedicated to design, develop and manufacture a wide range of superior quality valves. DoTEC has been performed its professional in service. DoTEC’s ball valves(Side entry, Top entry, Floating, Trunnion) are used in installations for petrochemistry, chemistry, nuclear power, oil field and refinery domestically as well as internationally. Especially, metal sheet ball valve, which is the best quality with a patent, is used in high pressure and temperature conditions as its metal sheet ball valve is set with permissible leakage Class VI, not Class IV like other companies, and managed with even zero leakage in accordance with customers’ requests. DoTEC’s swivel joint plays a role, sort of like a heart, to connect with hydraulic system of moving parts in airplane, vessel and truck with high pressure fitting with the degree of freedom as arm and jumper parts loaded or not loaded. A swivel joint has a link that swivels with dynamic water and air tightness. It can be applied to various industrial fields that use machines that move compressed air or oil pressure, and has been proven useful in equipment such as oil drilling and refinery. [INQ. NO. 1510M28] Prosave is a world class industrial valve manufacturer, specialized in manufacturing and supplying explosion relief valves for power plants, maritime plants and vessel plants. Prosave’s air release & vacuum breaker valve is mainly installed in power plants, water desalination plants, and maritime plants. Its main function is to control the air pressure in the pipe by releasing the air out of the pipe for the prevention of damage of the pipe and the pump. The product ensures surge and water-hammer protection, liquid overflow protection, and supply of high capacity venting for pipeline protection. It is supplied to leading conglomerates including Hyundai Heavy Industry. Prosave’s vacuum breaker valve is mainly installed in power plants, water desalination plants, and maritime plants. Its main function is to prevent damage by inpouring air in the atmosphere to pipes and tanks when it becomes a vacuumed state. It utilizes the latest technologies to provide protection against positive or vacuum over-pressure, prevent air intake, evaporative losses of product and help, and to eliminate odorous and potentially explosive vapor. Prosave’s crankcase explosion relief valve is a valve that prevents explosion of a vessel’s diesel engine. It acquired product certification from MAN Diesel & Turbo, a multinational company based in Germany that produces large-bore diesel engines, and numerous classification bodies around the world and supplying them to the world’s major engine makers. This product’s benefits include perfect protection for fire explosion, quick opening and fully relieving pressure, and non-damaged stronger structure. [INQ. NO. 1510M27] Total Engineering produces order-made and semiorder-made valves corresponding to special specifications for various plants in over 20 countries since its establishment in 1992. Thanks to so many years of faithful commitment to meeting customers’ requirements, Total Engineering has gained a large number of partners including Daelim Industry, Samsung Engineering, LG Chemicals and Hyundai Heavy Industry in Korea and CTCI, HMC and TECNICAS abroad. Currently Total Engineering is in the progress of such several global projects as Oman Sohar Refinery Improvement Project, Malaysia TNB Fast Track 3A Project, Saudi Arabia Rabigh Phase II Petrochemical Project, and Vietnam Thai Binh 2 Thermal Power Plant. Already Total Engineering carried out some global projects including India Haldia Project, Saudi Elastomer Project. Currently, Total Engineering, for such global projects, manufactures various types of industrial valves such as ram piston valves (metal to metal seat type with no leakage, durability under high temperature, high pressure), knife gate valves (metal to rubber cushion of two ways usage), long knife gate valves (three sealing system – seat, packing, and bonnet), slide gate valves (no leakage, no dead space), diverter valves (open-close, change of direction function, filtration space, minimizing loss of pressure), self lapping valves (blade recovery function), change over valves (maintenance with open-close function of pipe line), blind valves (fluid-blocking function for maintenance to maintain process for a long time), and strainers (impurities of fluid filtering function in pipeline). Filed Under: Machinery Tagged With: blind valves, change over valves, diverter valves, Industrial valves, knife gate valves, long knife gate valves, ram piston valves, self lapping valves, slide gate valves, Total Engineering Co. Ltd.
Daeryoong Valve manufactures different kinds of world-class valves, especially for curing presses for tires, utilizing up-to-date precision processing and testing facilities, while gaining a high reputation from the global market. Among its current major flagship valve items are 3-way & 2-way piston valves, control valves, pressure regulator valves, lift check valves, 4-way piston valves, and pan check valves. The maker’s valves are normally installed in curing presses and are being specially used for manufacturing a high quality rubber and tire product, controlling fluids such as steam or water, nitrogen, air, etc. The special technology for durability, design, is applied, and thus they ensure the users greater economic benefits compared to the existing similar ones in both at home and abroad market. The packing section of those products is significantly intensified to minimize leakages and to extend the life of valves. 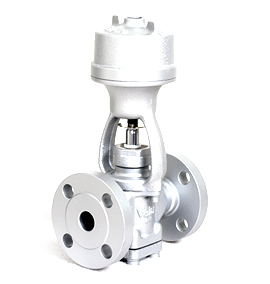 The SCS13 (Stainless Steel Casting) material is especially used for its sturdy and practical valves. The company’s 3-way & 2-way piston valves are capable of perfect sealing with the mounted disc ring made of PTFE. Two stem structures of those absorb the impact in the seat. Body and low seat flange of those valves are made of stainless steel. Shot peening process is applied to increase the lifespan of these valves.